Most people have heard of a root canal. The idea of needing a root canal tends to create unneeded fear for its recipients. Most of a persons anxiety in relation to this procedure is caused by misinformation or a lack of knowledge of what to expect. The question is,”what is it and why do you need it?”. Let’s start by explaining why a root canal is needed. This procedure is needed when your tooth’s root becomes damaged either by injury or a deep cavity. The pulp (soft tissue inside the tooth) has become inflamed or diseased. At this point, a patient typically displays symptoms of pain and swelling. If this situation is not addressed, the tooth can become irreparable. However, that is not the only thing. A patient with an untreated infection, even in a tooth, will become more ill as time passes. How Is A Root Canal Performed. First of all, not all dentist will perform a root canal. If your family dentist does not perform that procedure, he will recommend an Endodontis (which is a dentist that specializes in root canals). During a procedure, the troubling tooth is numbed. An opening is made in the crown of the tooth where special tools are used to clean out the infected canals and root of the tooth. Once that is complete, your tooth is filled with a permanent material to ensure that your tooth remains free of contamination and infection. The final step fills the crown of your tooth with a temporary filling. The temporary filling will remain until a permanent filling or crown is used to replace it. What Is The Alternative To A Root Canal? The only alternative to a root canal is to pull the tooth. As a dentist, I always recommend working to keep all your pearly whites as they are not replaceable. It is a cheaper option but ultimately can cause you other dental issues as time moves on. For example, teeth shifting, eating, bone loss. If you have a chipped tooth, you’re not alone! 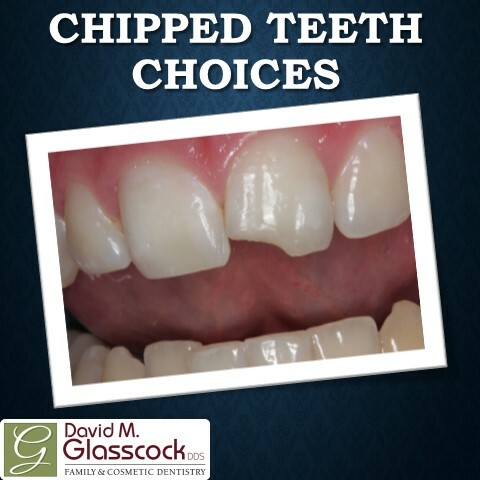 In fact, chipped teeth are the most common dental injury today. But don’t let that little-known fact fool you into ignoring a chipped tooth; any type of dental trauma deserves immediate attention. A small chip may not cause you pain, but there could be damage underneath the surface of the tooth. Our dentist can rule out cracks or internal tooth problems that aren’t visible to the naked eye. And in many cases, your chipped tooth can be repaired in just one visit. Dental Bonding — Most chips can be corrected with dental bonding. Dental bonding is an efficient, durable and cost-effective way to correct minor chips. Enamel Shaping — Often used in conjunction with dental bonding, enamel shaping can also correct small chips or surface flaws. During enamel shaping, a small portion of the tooth’s surface is removed or recontoured to smooth out imperfections. Dental Veneers – If the chip is significant and dental bonding or enamel shaping can’t be used, you may need a veneer. These thin, porcelain wafers completely cover the surface of the tooth and are often used for front teeth. Root Canal – Pain in the location of the chip can be a sign that the nerve is exposed. If that’s the case, a root canal may be necessary to save the tooth. Dental Crown — A dental crown is used to completely cover larger teeth or to cap a tooth after a root canal. Tooth Extraction — If the tooth can’t be saved, a tooth extraction may be necessary. The good news is a dental bridge or dental implants can replace missing teeth.